she offers advice on how to reduce edema based on her own experience. The support of a product to introduce in this page is only a Japanese country. Then, an instruction manual and a product are Japanese specifications. Attention : It doesn’t answer a question from the foreign country except for Japan. The swelling of lymph nodes does not occur suddenly, and because of that, there is no sense of crisis to the medical institutions, resulting in delayed treatment. Further, treatment for swollen lymph nodes is not covered by most insurance plans. This paper introduces the MEDOMER and Dr. MEDOMER massage machines for home treatment of edema. Blood controls oxygen and nutrition to the body’s cells. The lymph system is part of the immune system that prevents infection from pathogenic organisms. The lymph system is distributed throughout the entire body. A lymph node is where individual lymph vessels combine. The function of lymph nodes is to filter the lymphatic fluid. Cancer cells can spread to other parts of the body through the lymph system. In an operation to remove cancerous tissue, the lymph system around that tissue is removed as well to insure against the cancer spreading. The lymph vessels are severed, and lymph flow is obstructed locally. This can result in swelling of lymph nodes. As part of an operation to remove cancerous tissue, the nearby lymph system can be removed as well to prevent the cancer from spreading to other parts of the body. Because of the obstructed flow, swelling of the lymph nodes can occur. The swelling is due to an accumulation of pathogenic organisms, proteins, and water that are normally processed and flushed away. This is unhealthy for the body, and can cause sickness in addition to the edema. 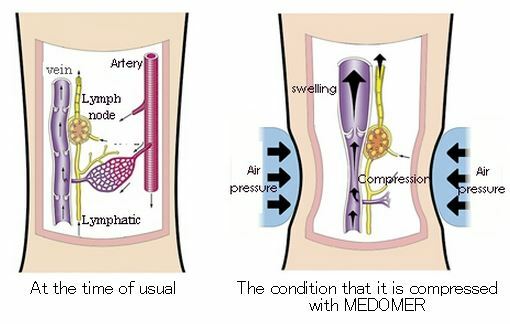 When sickness occurs with edema, it is often diagnosed as swollen lymph nodes, as distinguished from other types of edema. The lymphatic system is distributed along the circulatory system throughout the entire body. In the case of breast cancer and uterine cancer, the lymph nodes near those areas connect some of the main vessels in the lymph system. Consequently, flow of lymphatic fluid from the extremities is diminished. It seems that sickness due to swollen lymph nodes is probable with these types of cancer. Getting sick due to lymph node swelling can occur in cases other than cancer operations. There was a case of a man with a broken collar bone who experienced swollen lymph nodes stemming from damage to the lymph system in the breast area. This was a relatively rare occurrence. In some cases, swelling of the lymph nodes does not occur immediately following surgery, but can appear as many as 20 years later. Even if lymph node swelling is relieved, it can not be cured completely. But don’t be disappointed, because an animal has the ability to heal naturally. It is said in Japan that illness is part mental, and to have a positive mental outlook will help the healing process. Further, it is said that a severed lymph vessel will regenerate little by little. Edema and numbness are eased if one expects it and is devoted to the treatment. It is necessary to massage the area regularly to avoid a buildup of fluid over time. Let’s believe that the lymph system is regenerating, and do our best. In the case of the leg, blood and fluids tend to collect at the bottom due to gravity. In addition to elastic stockings and bandages that are conferred by doctors, the best treatment is to do massage of the legs. In the case of the arm, lymphatic fluid accumulates due to centrifugal force and gravity. Don’t carry heavy baggage or swing the arms, as in playing tennis for example. Keep the posture such that the lymphatic fluid always flows in the direction of the heart. When sleeping, use cushions to elevate the affected area above the level of the heart. Start treatment early without waiting for symptoms of edema to appear following the operation. After symptoms are present, it takes a longer time to reduce the effects. In the case of the arm, raise it and massage it gently to push the lymphatic fluid in the direction from the finger tips toward the shoulder. 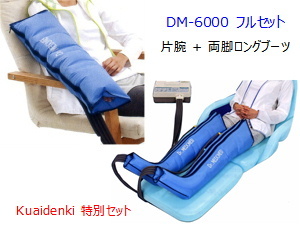 In the case of the leg, a bed or sofa is used even when a massage machine such as MEDOMER is used. Elevate the leg to a position higher than the heart to help the fluid flow. Massage the leg in the direction from the tip of the foot toward the hip. If nausea occurs during the massage, stop the massage at once. Nausea sometimes occurs because of a rapid increase in blood flow. October 1997 ? I was operated on for breast cancer in the right chest. April 1999 ? Edema and numbness appeared in my right arm. My doctor recommended massage, which I received every morning in the hospital. In the evening, in the orthopedic section of the hospital, four turrets were attached to the sides of the bed. My arm was placed into an “L” shaped holder and fastened with tape. The holder was hung with wire from the turrets as I slept. It was impossible for me to sleep in this position, but I continued out of the single-minded desire to cure the edema. 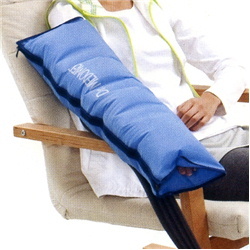 I learned about the MEDOMER air massage machine by looking in a catalog of medical devices. I did some research on ways to reduce the swelling of lymph nodes. My doctor recognized my hope, and then I began to use the MEDOMER massage machine. May 1999 ? Edema began to ease, and numbness became slight. June 1999 ? When my condition was at its worst, there was a 2.5 cm difference in size between my left arm and right arm. Now, numbness has disappeared and the edema has stopped being conspicuous. It was possible for me to wear short sleeved shirts during the summer, which I was afraid to do before. February 2000 ? Edema is stable and anxiety has disappeared, although some edema appears when I overwork or go on a trip. May 2000 ? On the train, even though there were empty seats, I stood up and raised my hand to hold onto a strap. It seemed strange to the surrounding passengers, but that is my normal posture to improve the swelling of my lymph nodes. December 2002 ? I am reaching my long awaited result, while doing massage two times per week. My condition has continually improved, and I forget about my illness. I believe that the lymphatic vessels are regenerating, and I want to live comfortably. January 2003 ? 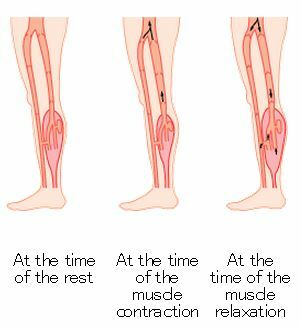 Edema is best restrained by early treatment, and it can be kept in a controlled state so that there is no hindrance to daily life. Though each individual is different, there is a chance for everyone to improve. Let’s have hope, and work toward a cure without giving up. The MEDOMER air massage machine creates an action that is similar to muscular contraction and relaxation by pressuring and relieving multiple air chambers in a boot placed around the affected body area. This promotes return blood flow and lymphatic fluid flow. Boots are composed of four air chambers. There is a wave mode, in which successive chambers are pressured one at a time. There is also a squeeze mode, in which successive chambers are pressured, ending with all four chambers under pressure simultaneously. After the fourth chamber is pressured, the chambers are relieved, and the cycle repeats again. Do not use MEDOMER if there is a sprain, bone fracture, or other such condition near the swollen area. Stop use and consult with a doctor if there is an infection or if any fluid escapes from the swollen area. Stop use and consult with a doctor if there is pain or abnormal discomfort. In the case of the arms, elevate the arm higher than the heart. Wrap the arm with plastic wrap directly on the skin to promote perspiration. Wrap in the direction from the hand to the shoulder. Wear an elastic bandage. In the case of the legs, elevate the leg higher than the heart. Wrap with plastic wrap directly on the skin. Wear an elastic stocking. This is best done while laying of a bed or sofa. If the edema is in an early state, set the timer for 20 minutes or less. Perform the massage three times daily. Be sure to read the instruction manual before using MEDOMER. If you notice any unusual discomfort, stop use and consult your doctor.